Pete Rose finally received a ruling in his case for reinstatement, but not the one he or his fans hoped for. In 1989, the all time hits leader accepted a lifetime ban from the game of baseball. For the next 15 years, Rose would vehmently deny betting on baseball and continued to seek reinstatement. In 2004, Rose changed course and finally admitted to betting the game of baseball. Not resulting of a need to exercise his inner demons, but the admission would dramatically improve the financial success of a book, from which he would profit from. The idea that the all time hits leader will never be enshrined in the hallowed halls of Cooperstown, NY is becoming a clear reality with Commisioner Rob Manfried’s ruling. In the eyes of the modern day fan, especially the millenials, the lacks fairness in having conversial players linked to steriods listed on the Hall of Fame ballot while Charlie Hustle is an outcast. Although many of those accused and admitted steroid users might join Rose in not achieving enshrinement, many fans want to at least give Rose the opportunity to not get the minimal level. But, the situations are not really apples to apples. Although betting is legal in some states, MLB bans betting on baseball and has historical precendence, which was well in place at the time of Rose’s infraction. Despite PED violating federal drug laws, in terms of usage and obtainment, MLB did not have testing or bans in place, conveniently for the linked users. While it rubs many of us the wrong way, Rose had precedence against him and he knew what would happen once he was caught. While Shoeless Joe Jackson was thrown out of the game, Rose accepted his lifetime ban before receiving the same fate. I was a big fan of Pete Rose, even completed one of my childhood book reports on a book about his career. As a Phillies fan, I appreciate the boost his presence gave my team in 1980. Who in Philly does not love watching this play from the 1980 World Series? 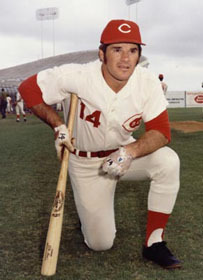 Pete Rose is a baseball icon. His career speaks for itself, whether or not he ever is placed in Cooperstown. But, he made a major mistake and accepted the punishment of a lifetime ban. Regardless of whether we like it or not, MLB has the right to hold Rose to his word, despite the historical proof that it means nothing from a man who seeks personal profit.